Dimensions: 4-3/4 x 6-1/2 in. 144 pages. WTF happened last night?! Don’t remember? Not to worry. 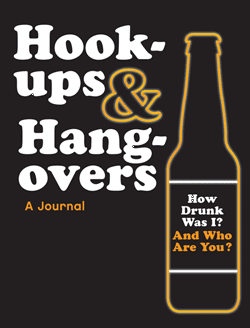 Hookups & Hangovers is here to help piece together all the hilarious and humiliating details of last night’s party. Playful prompts—including “Where did I wake up?” and “So drunk, I can’t believe I . . .” as well as space to rate your hookups and hangovers—make this guided journal the perfect accessory for the morning after.